An enzyme-blocking molecule can extend the lifespan of Caenorhabditis elegans roundworms by as much as 45%, largely by modulating a cannabinoid biological pathway, according to a study from scientists at Scripps Research, California. The scientists, whose work is published in Nature Chemical Biology, also showed that the lifespan-extending cannabinoid pathway in C. elegans is related in unexpected ways to cannabinoid pathways found in humans and other mammals. "This study reveals a new life-extension pathway – but more broadly, it introduces a powerful method for applying chemical probes to lab animals such as worms to discover biology that may be relevant to humans," says Benjamin Cravatt, PhD, study senior author. Cravatt is known for his development of advanced "chemical proteomics" for studying enzymes and the biological pathways they regulate. 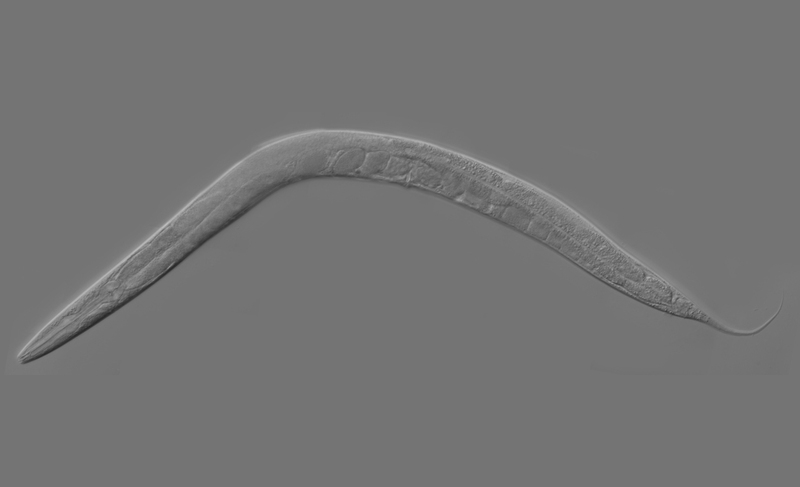 In the new study his team deployed these methods to investigate aging in C. elegans roundworms. The tiny worms normally live for just a few weeks, compared to two or three years for lab mice – making them, in principle, more practical for lifespan studies. Lifespan studies using C. elegans worms typically involve the deletion or silencing of a particular gene in the embryonic stage of life, to see if that extends the average lifespan of affected animals. 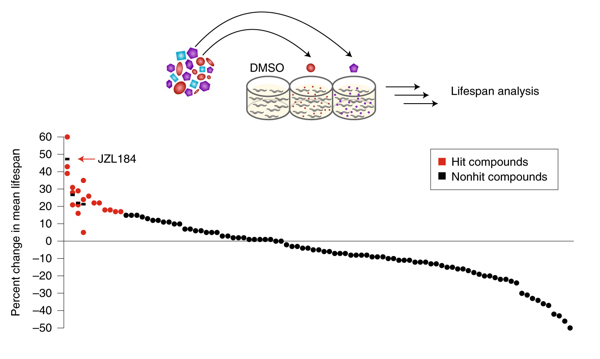 The Cravatt team's approach, by contrast, was to use small-molecule compounds to disrupt enzyme-related pathways in adult worms, in the hope that this would uncover pathways that regulate lifespan. "The beauty of this approach is that any lifespan-extending compounds we identify can be useful tools to study whether the same mechanisms and targets also modulate aging in mammals," says co-author Michael Petrascheck, PhD, from the Department of Molecular Medicine at Scripps Research. The team used a library of 95 such compounds, all known to inhibit enzymes called serine hydrolases in mammals. "Metabolic processes are very important in determining the rate of aging and lifespan, and serine hydrolases are major metabolic enzymes, so we thought there was a good chance we'd find an important aging-related enzyme this way," says study first author Alice Chen, a graduate student in the Cravatt lab. After finding ways to get the compounds through the tough outer skin of the worms, Chen tested them on worms that were one day into adulthood and found that some of the compounds boosted average worm lifespan by at least 15%. The most suitable one – a carbamate compound called JZL184 – extended lifespan by more than 45% at the optimal dose. Over half the worms treated with JZL184 were still alive and healthy at 30 days; a time when virtually all untreated worms were dead of old age. JZL184 was originally developed by Cravatt's lab as an inhibitor of the mammalian enzyme monoacylglycerol lipase (MAGL), whose normal job includes the breakdown of a molecule called 2-AG. The latter is an important neurotransmitter and is known as an endogenous cannabinoid ("endocannabinoid") because it activates one of the receptors hit by the main psychoactive component in cannabis. "It seems at least plausible at this point that both worms and mammals have a cannabinoid-related signalling pathway that affects longevity and possibly aging-related disorders," Cravatt says. The study demonstrates more generally how libraries of small-molecule compounds and associated proteomics techniques can be used to reveal biological pathways that evolutionarily distant lab animals, such as worms, have in common with humans. "In principle, with this approach, one can quickly find a compound that has a desired biological effect and also find the target through which it works, all in a live and relatively complex model organism," Cravatt says.